Samsung Sells More Than 10 million Galaxy S4's - Beating its Predecessors. Samsung redefine the Smartphone experience with their newly launched, Samsung Galaxy S4.Adding Galaxy S4 to the range of Galaxy series on 27th of April. Within the month according to the Samsung’s South Korean tech manufacturer, more than 10 million devices are sell globally. This new Smartphone from the Samsung breaks the sales record of its predecessors in first-month sales. 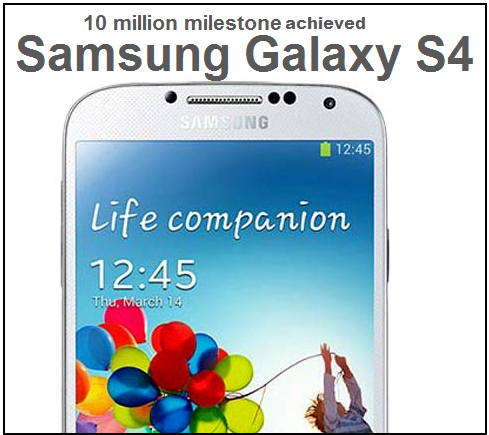 For reaching the 10 million mark Galaxy S3 took about 50 days, galaxy S2 reached the milestone of 10 million after 5 months after its launch and in addition to this galaxy S took more than seven month. Samsung Galaxy S4 is receiving glowing reviews from all corners. The device is now available in over 155 countries. It has got a 5-inch Full HD Super AMOLED Multitouch screen display , 13MP primary camera with flash, HD Recording and Auto Focus and a superfast quad-core 1.9 GHz Snapdragon 600 processor. Device has O.S Android 4.2.2 (Jelly Bean) with 2GB RAM. This superphone has Accelerometer, RGB light, Geomagnetic, Proximity, Gyro, Barometer, Temperature & Humidity, IR sensors. Samsung is also planning to bring more color variations with the device.On the behalf of Samsung we thanks millions of people for choosing Samsung Galaxy S4 .